AUSTIN, Minn., Sept. 12, 2017 /3BL Media/ — Hormel Foods (NYSE: HRL) has launched its 11th annual corporate responsibility report. The report is available online at https://csr.hormelfoods.com/ and includes information related to the company’s corporate responsibility performance in fiscal 2016. The Hormel Foods 2016 Corporate Responsibility Report follows the Global Reporting Initiative G4 guidelines and is in accordance with the core option. The report is designed to allow stakeholders to easily view top-line highlights through the interactive website. 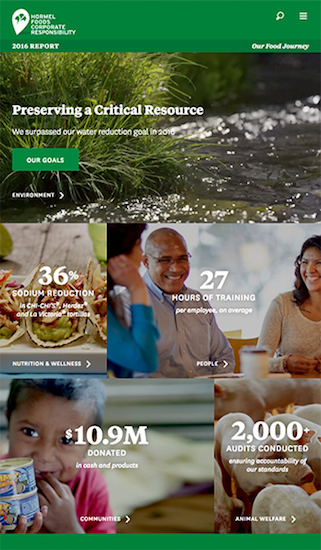 For more information about the company’s corporate responsibility goals and progress, please visit https://csr.hormelfoods.com/. Hormel Foods Corporation, based in Austin, Minn., is a global branded food company with over $9 billion in annual revenues across 75 countries worldwide. Its brands include SKIPPY®, SPAM®, Hormel® Natural Choice®, Applegate®, Justin's®, Wholly Guacamole®, Hormel® Black Label® and more than 30 other beloved brands. The company is a member of the S&P 500 Index and the S&P 500 Dividend Aristocrats, was named one of "The 100 Best Corporate Citizens" by Corporate Responsibility Magazine for the ninth year in a row, and has received numerous other awards and accolades for its corporate responsibility and community service efforts. In 2016, the company celebrated its 125th anniversary and announced its new vision for the future - Inspired People. Inspired Food.™ - focusing on its legacy of innovation. For more information, visit www.hormelfoods.com and https://csr.hormelfoods.com/.